subscriber-only perks from Glue & Ink! Get Free "Super Tweet!" Clip Art! Yep, this set is usually for sale—but you can get it free instantly! We'll email you with subscriber-only news—freebies, updates, videos, and more to help your own classroom materials (and products, if you're a teacher seller!) stand out! Get this clip art set for free! Great for newsletters, worksheets, name tags, and more! Thanks for subscribing! 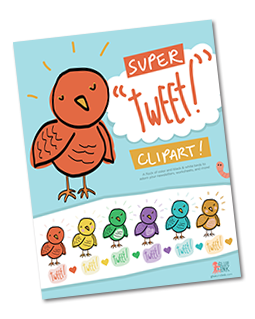 Now check your email to confirm your subscription and grab your FREE Super Tweet Clip Art Set!